Be Our Guest is an interactive evening with stories of impact, a fantastic dinner party, and live and silent auctions. In 2018 we held our 3rd annual Be Our Guest fundraising event. We are humbled by the support of the 272 people who joined us that evening. We grossed a record of $142,491 (net $135,770)—enough to serve 483 guests with our full range of services, or serve 38,900 delicious and nutritious meals. Be Our Guest is not your typical gala – it is an interactive evening with stories of transformation topped off by a fantastic dinner party. Join us for an opportunity to invest in Philadelphia through a unique and impactful event supporting our vulnerable neighbors through radical hospitality. 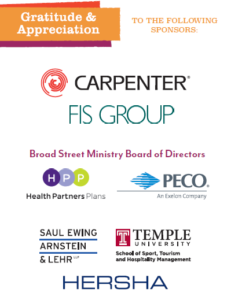 Your Sponsorship includes dinner, drinks, live and silent auctions, and a way to create positive change for the city of Philadelphia and our vulnerable neighbors. To secure your sponsorship of our community and this unique event, contact Jessica@broadstreetministry.org. To those who have the least, we offer the most. To those who have more than they need, we invite partnership and contribution. And to you, we extend an invitation to join us at our tables and help turn on the light. In 2017 we served 72,475 meals to 6,765 unique guests. We provided a safe mailing address for 4,587 people; distributed 12,650 pieces of clean clothing and shoes; provide 65,600 toiletries, socks and underwear; and welcome 2,365 visits to the therapeutic arts table.